It's not the most flexible reverb we've used, but when it comes to pure quality of sounds, TSAR-1 is up there with the best. Rich, complex sound. Useable presets. Medium, small and gated space excel. No dedicated low-cut options. Only one algorithm. For a time, convolution reverbs were all the rage, narrowing the gap between the hardware reverbs - and real spaces - we desired and their often inadequate software equivalents. Thankfully, the last few years have seen algorithmic reverb plug-ins seriously up their game, though - even Lexicon are in on it now. Softube's TSAR-1 takes its sonic inspiration from a number of classic reverbs and is visually. However, it's a bang up-to-date 'true stereo' design using an algorithm that's all its own. "As expected, there is an overall 'signature' to the sound, and we have to say it's a very pleasing one." In terms of options, things appear pretty simple, split between slider parameters (pre-delay, decay time, density, tone and high cut) and top row options (early reflections, size and mix, diffusion type, modulation type and overall reverb mix). The same ten parameters and their values are shown in the central display panel, with the previous setting in brackets - clicking on a parameter toggles between the current and most recent value. Reverb time ranges from 150ms to a cavernous 15 seconds with predelay up to 1 second. TSAR-1 is structured such that early reflections and the main reverb tail are handled separately and mixed. The majority of available parameters are concerned with the tail. The package also includes the 'bonus' TSAR-1R plug in, which has a simplified control set. 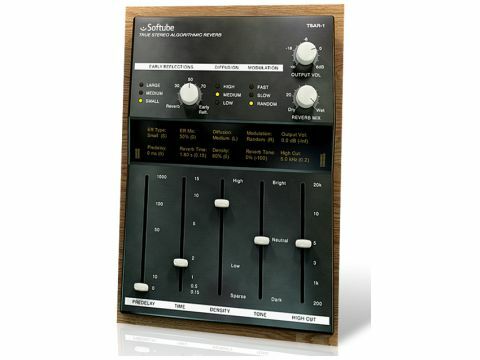 The 'true stereo' nature of TSAR-1 refers to its handling of incoming stereo signals. In old reverbs, if you panned a signal hard left, the reverb would only be heard in the left channel, which is nothing like real life. TSAR-1 uses four reverb engines simultaneously to mimic the effect of stereo sources in a stereo space, and while this is desirable in theory, it's not the only modern reverb to offer true stereo, and neither is it guaranteed to give better results. TSAR-1 includes a reasonable set of presets split between application-specific types (drum chamber, guitar room and so on) and emulations of vintage units. Although there are some large hall options here, there's an excellent selection of medium and smaller spaces. As expected, there is an overall 'signature' to the sound, and we have to say it's a very pleasing one. TSAR-1 delivers everything from a wonderful medium-sized performance space (Jazz Club), to tracking rooms (Studio A and B) and then onto the equipment-influenced AMS Ambience, Digital Snare and various EMT- and Lexicon 224-style presets. In the mix, TSAR-1 produces an excellent, rich sound that meshes very well with the source material, and the CPU hit is minimal. On the downside, we particularly missed any kind of low frequency control (either multiplier or low cut). What's more, the high cut seems to roll off the early reflections much less than the reverb tail. However, we were still able to create some excellent width-enhancing effects using just the early reflections, and kept returning to the presets for inspiration. The only other slight niggle is that all presets launch 100% wet. In the end, all moans are minor when you consider TSAR-1's excellent sound, making it a solid buy if you're in the market for a serious algorithmic reverb.